I’ve been researching pigeons and I read about how the last wild passenger pigeon was killed in Ohio by a boy with a shot gun. I was all prepared to hate him and vilify him in my book (if I get to write it) but when I researched it, I didn’t get any sense that he was a bad kid. He saw a bird he’d never seen before and he asked his mother for permission to shoot it and she gave it. Someone close to me (don’t want to name names) used to be a hunter, and it was something I could never wrap my head around, because he’s so nice otherwise. Sweet, really. I could more easily imagine him freeing an animal from a trap and taking it to the vet to have it’s leg mended before I could see him killing anything. Last week I learned he hasn’t hunted for a while. He’d had an awakening about hunting and was now filled with guilt about all the hunting he’d done. I don’t want him to be filled with guilt, but I was enormously relieved. It never made sense to me. I guess it must be similar to how people rationalize killing other people. They are bad (ie, pigeons are rats with wings) or some other reason why the creature’s life isn’t valuable. Or that they don’t hold on to life and want to live every bit as much as we do. 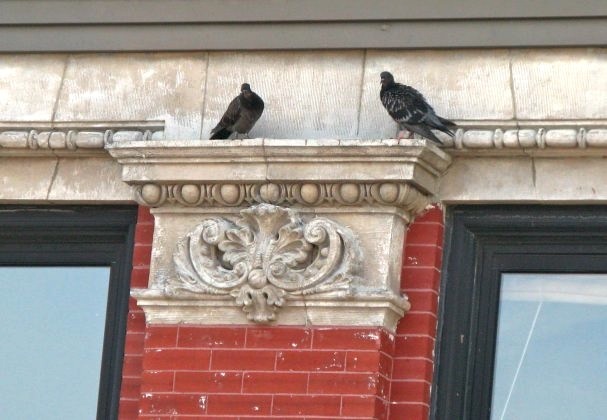 Pigeons on the building across the street. Don’t worry little guys. I’m unarmed. That would be the late 19th century? Without knowing particulars, I can easily see the bird being the difference between eating dinner that night or not for that family, since this was a time of fairly widespread poverty (between 30% and 45% nationally according to http://cdclv.unlv.edu/healthnv/poverty.html ) and I’m assuming also a much less stable food supply than we have today. Even in what we think of as the Industrial Age, for a lot of people it still came down to: if someone didn’t catch something while hunting, they & their family went to bed hungry. I am not a hunter, so perhaps I am not the person to explain. But I come from a farm/hunting family, so I do understand it. The person who wrote above about the pigeon being supper makes an excellent point. My family always ate and appreciated whatever they could hunt–mainly deer and squirrels but also some rabbit, and we knew a guy who hunted snakes for meat and their skins. In my experience hunters do try to be humane in their kills, going to great lengths to track animals they didn’t kill instantly so no animal was out there suffering. In some respects I think that kind of hunting for wild game is more humane than industrial food farming, as is done currently with chickens, pigs, etc. Steven Rinella does a nice job of explaining the hunting/meat ethos in his book The Scavenger’s Guide to Haute Cuisine, as does Catherine Friend in her book The Compassionate Carnivore (I think that’s the title). All of that said, I must admit I’ve never understood hunting or shooting a gun at a firing range “for fun” so I can’t defend that. And although my family supports the 2nd amendment in terms of rifles for hunting and home protection, we can’t think of any reason why anyone would need handguns or assault rifles. In our region hunting also is somewhat necessary for deer population control (important in terms of balancing deer herd health, road safety, and crop protection) and also monitoring chronic wasting disease in the herd, which is the deer version of mad cow disease and is quite serious. Hmm, well….when I was about 11, one of my uncles took me hunting with him. Yeah, I’d begged and begged to go, and finally he agreed. Well, he shot a squirrel and then, he made me watch him skin it and my grandmother cooked it. Trust me when I say I could NOT take one bite of that squirrel, and almost vomited. Lesson learned. I think if the majority of people today had to kill the meat they eat, there’d be LOTS of vegetarians like myself. And hunting for “sport?” No, just no. Give the deer a rifle and then it’s “sport.” ‘Nuff said. you know, one of the things that we share is that neither of us is ideological. I am decidedly on the right, and you are comfortably on the left, but neither of us is an ideologue. This is fairly rare today in a climate where everyone is screaming what the puppet masters have programmed them to scream. I’m not a hunter either. Although I did some hunting as a youth. In Texas, deer and turkey seasons are very big. We also have a pretty nice dove season. One of the things I see from the way you worded your post is that you are looking at hunters through a lens of urban values. Hunting probably emerges from more of a rural value system. As a consequence, when you try to understand, you have to see if you can avoid a kind of “ethnocentrism” when it comes to thinking about hunting. Where I live, people have to shoot predator coyotes and other predators that hunt their cattle, sheep or chickens. it is the responsibility of the rancher or farmer to defend his or her livestock against savage animals. it is understood that if they do not kill the coyote (we have a very few mountain lions out here as well), then the neighboring ranch will be hit by the predator. This is not a region where urban values will provide the necessary adaptation to reality. If we can consider that where you live you are a hundred years away from Little House on the Prairie, in many rural areas we are only 50 years away. This is simply a metaphor, of course. Hunters are mildly contemptuous of people who are so urban that they think their meat arrives wrapped in cellophane from the grocery store. The consumer somehow thinks that the brutality of slaughterhouses are more legitimate than the competitive involvement in the food chain. In hunting, the animal might get away; in the slaughterhouse the animal never does. Contrary to your perception, hunters do not devalue their game. In fact, hunters tend to amplify the majesty of the game that they hunt. This is why you see whimsical pictures of the great stag nobly gazing on the middle distance. Hunters often have a certain admiration for the game they pursue. Your post suggests the possibility of hunters not caring about animals. This is not true. In the rural areas, hunters are some of the primary caretakers of dogs, cats, horses, and even sometimes a case of a rancher having a pet cow even though he is raising beef. Hunters can be every bit as sweet, cordial, and hospitable as someone in an urban area. There really is no difference in disposition due to hunting. Many hunters start as children hunting with their parents. In my part of the world you can find people like me who do not hunt, but this is simply seen in the same way as someone who doesn’t play baseball or football. There is not moral judgement attached one way or the other. I would say that in many urban areas (and we have some in Texas), people relate to hunting through the lens of a false stereotype which keeps them from finding out the truth that hunters are just like them. In a way, people who come to hunting later in life do so for reasons not unlike someone who gets the bug for acting. The actor gets the bug. Suddenly the idea of portraying a different character than themselves becomes interesting; the different facial expressions and movements required to demonstrate a character. The way the role relates to other roles, the energy that goes back and forth when the actor is thrown a line and needs to make the appropriate response. Hunters get ‘into’ hunting. It’s the whole process, not simply the kill. The whole mobilization in the wild on a frosty morning, the primalness of the hunt where vestiges of an artificial moral construct are cast aside. Tracking the animals, lying in wait for hours not making a sound… all this and more become part of the culture of hunting, and it really grabs some people. I don’t know if this gives you a clue or not, but maybe it’s something to think about. Now of course I am trying to put a certain face on all of this for the purpose of giving you a better idea of what is going on in the hunting culture. However, it is also true that not all hunters are some noble breed. As in every endeavor, you have people with spurious motives and bad characters taking to the field. It would be wrong, though, to see all hunters from the point of view of the bad apples. I didn’t mean to portray hunters as evil and people who don’t love their pets. But I think the noble stag is a rationalization, to make the killing more palatable. It’s like the “noble savage” stereotype, which people presented as admiration, but was really a condescending and subtle form of racism. Honestly, I think hunters may be like the person I know who once hunted, they aren’t really thinking it through. I look forward to the day when we are all vegetarians, (I am vegetarian) which I believe will happen some day way down the line, if only for health reasons. By the way, I grew up in suburbia. I accept that I have biases based on where I’ve lived for the past 30 years, but I think the differences between me and people who don’t live in a city is pretty superficial. Actually, it’s because of growing up LI that I love cows. Who are so sweet. I hate what we do to them in slaughterhouses. We’re all going to hell if there is a hell. By the way, I should say, thank you all for taking the time to explain hunting from a different point of view. I totally get growing up in a culture where people routinely hunt for food. I appreciate you responding so quickly. I am not concerned about whether a person is against or for hunting. But there are a couple of things I wanted to address because it appears as if what I was trying to convey did not come across. Hunters do not hunt simply for food. They definitely enjoy it as a recreational pursuit. Perhaps a different example might make it clearer. In your part of the world (the Eastern Seaboard) more than mine, a lot of duck hunters work in teams with Labrador retrievers. The hunter shoots the duck and the Lab plunges into the icy water to retrieve the duck. The Lab gets an enormous kick out of this experience. Many breeds love to hunt. The hunter gets just about the same kick out of it as the dog. It’s a real back-to-nature experience. Human and animal working together hunting. Dogs that work as pointers also work in cooperation with humans for hunting, and they love it, just as bloodhounds love tracking jail breakers with their correctional officers. What am I trying to say here? This hunting business has a lot more to do with Jack London’s The Call of the Wild than some contemporary urban value. The hunter sees his game more like a competitor than just prey. It’s more like a football team rivalry where the rival is held in great respect even as your team works to defeat the rival. I know a guy who killed the third-largest polar bear in history. He alsmost froze to death along with his Eskimo guides. When he finally got a shot at the bear, he was doing well to keep his hands from trembling too much to make the shot against one of humans’ more fearsome predators. So you can see that much of the time the iconography of the animal is admiration of a sort. The only thing I know for sure is that in the millennia to come our sun will burn out, and this whole experiment will be precluded unless some higher power has other plans. The bear was not a consenting participant in this recreation. I see that as murder. I’m sorry. If he admired the bear he would not have killed it. We’re never going to agree on this, I’m afraid. Now I’m all upset about that polar bear. What if it was this one? that is an absolutely darling group of polar bears. Needless to say, this is not the polar bear that the guy who owns the drugstore down the street shot. I was trying to explain some of the inner motives and rewards of hunters. I have said a few times that I am not a hunter. I have no desire to hunt and do not plan to take up the sport. My view is simply that hunting has been with us since the earliest primitive man and will probably be with us until the social planners finally make sure that every inch of earth is paved over and turned into a parking lot. So basically I don’t have a dog in this fight. I think people can go to extremes on both sides. I got carried away! It was the poor polar bear. I’ll be back as soon as I google what I need to know. Yeah, well, about hunting: female circumcision has been around since the primitive days of human history too and nobody in his right mind would defend that on the grounds that it is to be respected and revered simply because of its antiquity. an honorary OBE for his contribution to literature. The following year, he was awarded the James Joyce Award of the Literary and Historical Society of University College Dublin. In the year of 2007, Bryson won the Golden Eagle Award. And he does not hunt. I should definitely read that book. Oh, it’s got too many holds on it at the library. That means when I get it finally, I have to read it right away, because people are waiting. I never finish them on time. I have to buy it. I don’t get hunting. The sport of it. Killing for recreation? I sort of feel the same about violent movies and videos. Violence as entertainment?